I thoroughly enjoyed the classes from the Modern Calligraphy Summit and became incredibly inspired to create after watching the wonderful artists share their work. 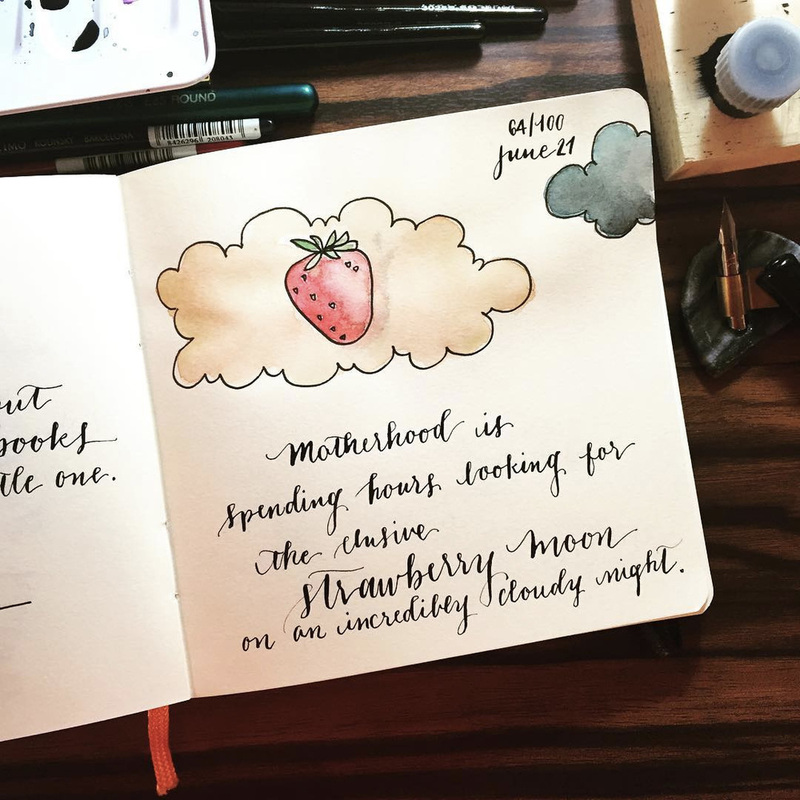 Since then, I've added doodling, watercoloring, and brush lettering to my growing list of creative outlets. 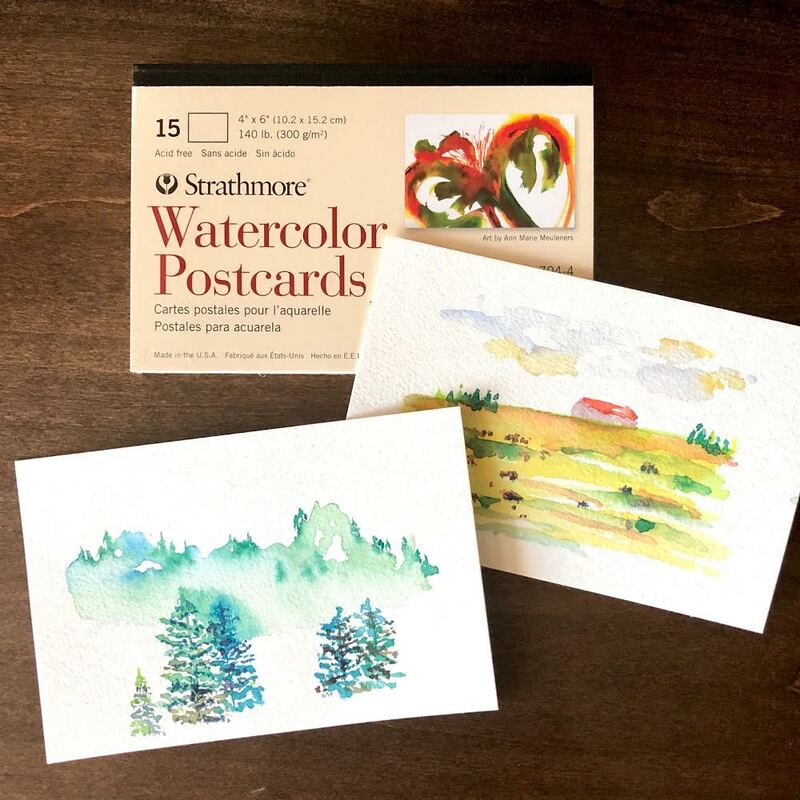 I then furthered my watercoloring curiosity when I stumbled upon Etsy shop owner, Ana Victoria Calderon's Youtube and Skillshare classes. I've been hooked on watercoloring since! I started researching non-toxic vibrant watercolors and invested in a few different pan sets as well as a few tubes to create my own 5-8 color palette. I even found time to putting it to good use and started mixing for color studying. It's been so much fun! 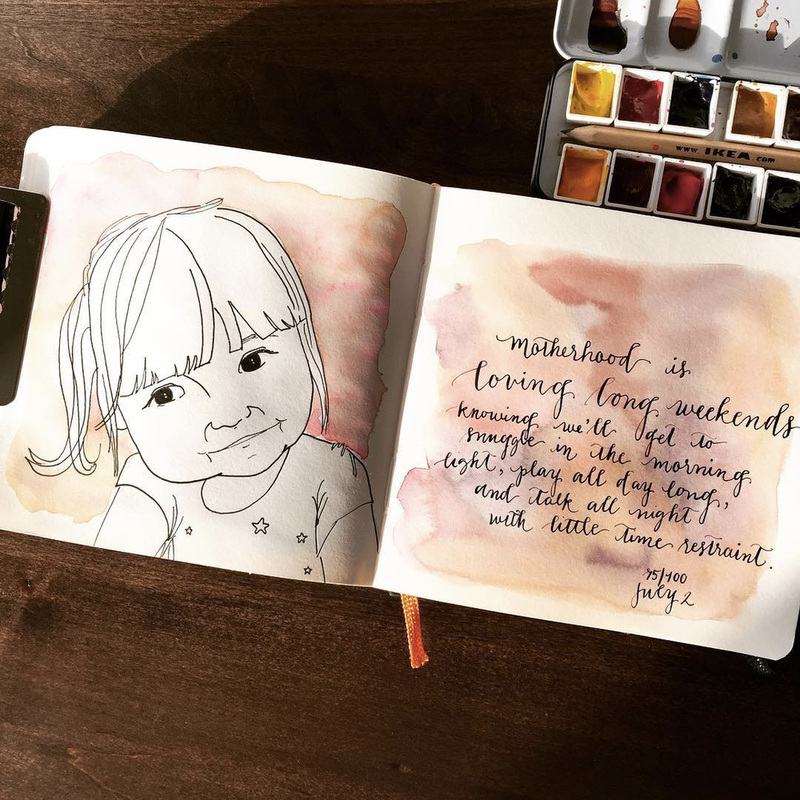 But it has been challenging to find a consistent routine to create, until stumbling upon the #the100dayproject hosted by @elleluna on Instagram. 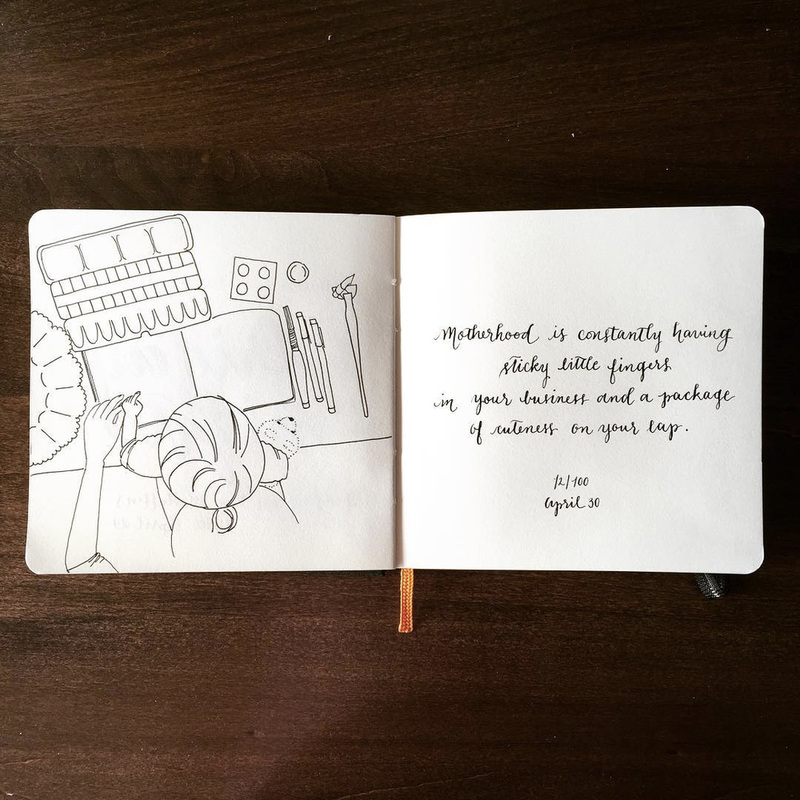 When I learned about the challenge I was immediately excited by the thought of having a small moment to be creative in some way, every single day from April 19 through July 27. Then it dawned on me that I am surely to miss days in between. In fact I missed day 1! What topic could I document creatively where the gaps in the 100 days could be a part of the art and story of the documentation? 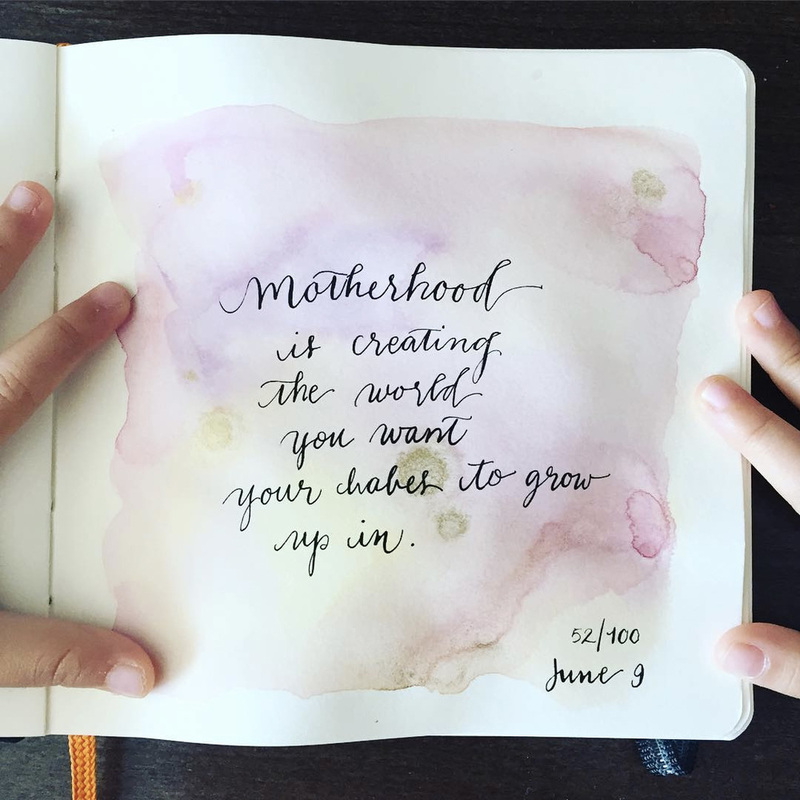 My subject is #motherhood to be filed under #pearls100daysofmotherhood2016 as a snapshot of what it's like for a regular working mum making life happen in Brooklyn, NY via Instagram. 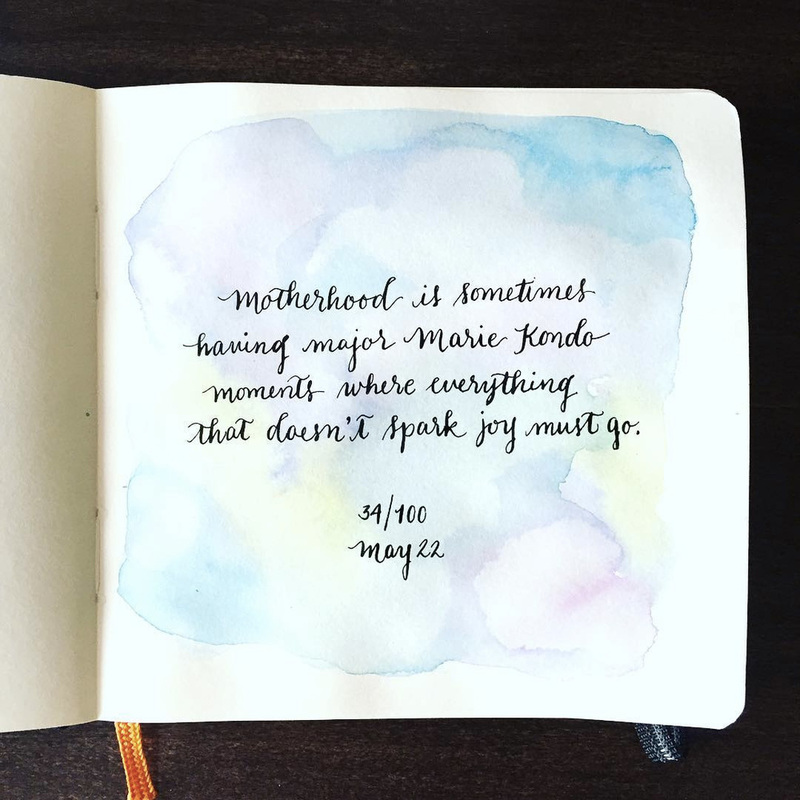 I'll express my lens of motherhood through a simple word, doodle, picture, memory, or watercolor exploration [almost] everyday for the next three months! 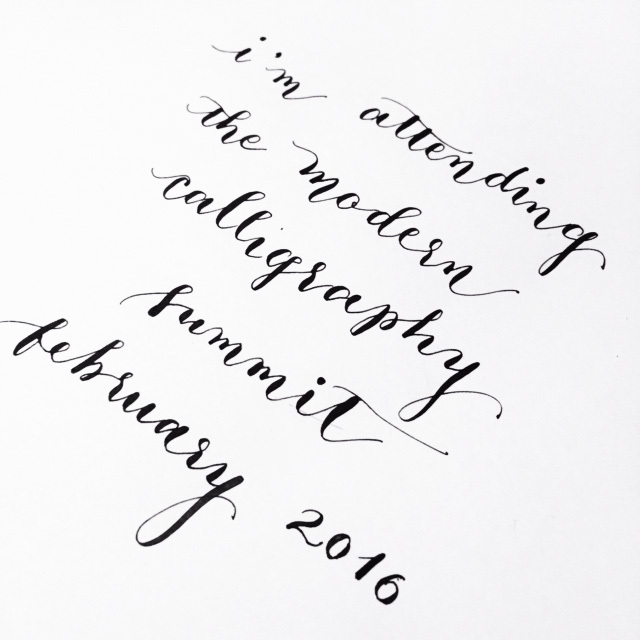 Back in September last year, I unexpectedly came across the Modern Calligraphy Summit thanks to Instagram and on a whim, decided to begin 2016 with a learning opportunity. The online classes begin today. I'm so excited to learn from the awesome artists and teachers every night at my own pace. Since signing up, I've found ways to put my nibs and ink to good use so I'm more prepared by now. Practice truly makes better. I'm no where near perfection or even close to consistency, but I've been warming up my hand and wrist to gain better control of my penholder and the way my nib meets paper. I don't practice everyday because it's nearly impossible with mommy, work, and home responsibilities, but when I do, I learn something new about my letterforms. Here are some of my calligraphy projects along the way. Finding the perfect nib for me. I started on Gillott 303 and 404 nibs. I then tried other kinds of nibs recommended for beginners and found the Nikko G nib to be most suitable for me. It's become one of my favorite nibs. I love the control I have when I use it because I tend to be a little more heavy handed and the Nikko G gives just the right amount of flex while being rather forgiving. 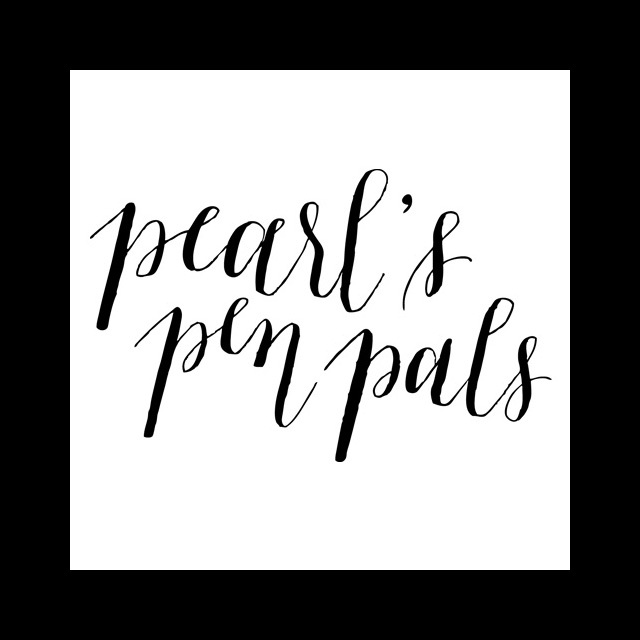 Updated Pearl's Pen Pals Etsy shop logo. My previous shop logo was created almost 5 years ago and a refresh was long overdue. Practicing. Every few weeks, I find myself looking back at older calligraphy samples to see what I can improve. I always find something and so I keep practicing. I think I'm finding more comfort in my own penmanship. Just compare the differences in a few months. The same words but notice the different flow and pace in the lines of my more recent sample. Turning calligraphy into a cake topper. For my babe's 2nd birthday, I vectorized my handwriting, die-cut it using my awesome Silhouette, and made a glitter cake topper for her kiddy party. After the party, I kept the topper and snipped off the dowels to use it as a scrapbook page keepsake/embellishment. It's one of my favorite calligraphy projects! I'm looking forward to learning a ton these two weeks! First and foremost, I am not an expert at potty training by any means and I've only done this once with a lot of help. So do not take this as advice. Take this as one family's story about potty training that was completed in only 3 days. Secondly, yes, this is a real change in gears from what I typically post here, but potty training is a real challenge for families and recently, it's been a bit of a topic amongst coworkers and friends. 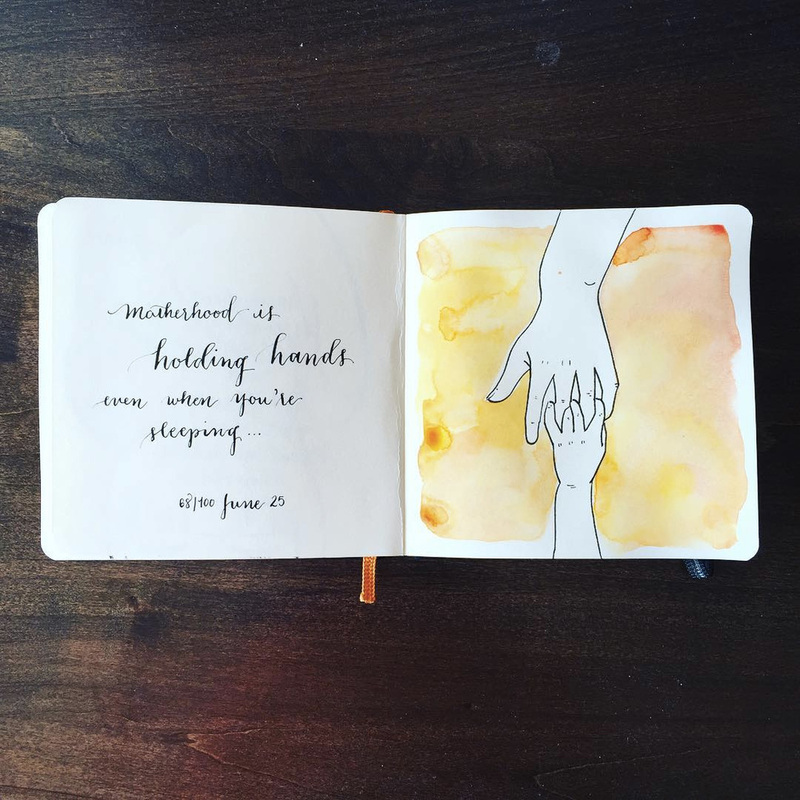 Sharing our story is to share that there is hope, even when it seems like it's impossible. Thirdly, I can't stress the importance of teamwork and learning from others! My husband did most of the work because we started over a weekend and he had to continue the routine during the week. I also consulted my group of friends who've done this before who gave me so much good advice. Having said all that, here's how we potty trained our 22 month old girl in 3 days. Our daughter started letting us know when she was going in her diaper. Reading her queue, it seemed like it was time to start the process with her. We picked a weekend/week to start where we could consistently be at home and near the bathroom. We picked out the set-up that we felt best suited us. We chose a potty seat on top of the toilet along with a step stool. We picked out comfy training underpants and decided to continue using her baby wipes instead of toilet paper as part of the training process. We had a full box of her favorite mini graham crackers on hand as a reward for going on the potty and her favorite mini cookies on hand as a reward for going #1 or #2 successfully on the potty. Day 1: Wearing only a shirt and underpants -- and nothing else, we let her go about her day. Every 20 minutes or so, we would bring her to the potty and for every successful sitting, we would reward her with a graham cracker treat. For every successful #1 or #2, we would reward her with a mini cookie treat. For every accident, we would say "uh oh" followed by "it's ok" and we would clean her up like no big deal. Our goal there was just to let her know that accidents aren't good but not to make her feel bad about it. Day 2: Same set-up, though we had a lot more resistance and we started doubting that she was ready because of the resistance. There was crying and I could tell it was hard for her, but then when she would have a successful #1 or #2, and she would be so proud and then she started asking for the mini cookie. As parents, we were torn and we considered stopping entirely. There were still accidents and we treated them the same. Day 3: Same set-up. Then she started telling us when she needed to use the bathroom. We were making progress. There were still accidents, but much less than Day 1 and 2. Day 4: Same set-up, but since she started telling us, we no longer put her on the potty except 30-60 minutes after a juice or a substantial amount of liquids. No accidents! Gradually, it became second nature to her and the diaper was long gone. Plus, the pants came back. We continued to read her queues and she continued to request cookies after successful potty visits. On the road: We pack a lightweight portable potty for the road. The first few times on the portable potty in the car or in a public bathroom is a bit of getting used to but one the kiddo gets it, it's easy because the portable potty is their security potty. She learned rather quickly, especially since we used the same reward system. Going out: The portable potty is nice and clean. It's perfect for the car. But one of our friends also suggested a foldable seat that goes above toilets. We keep that around along with seat covers for emergencies. During naps: Our toddler tends to take short naps of 1-2 hours, so we decided to keep her in her underpants. However, the trick was to make sure she went on the potty within 10 minutes of getting up. During nights: After her last #1 of the evening, we switch to easy ups. Every morning after her first #1, we switch back to big girl underpants. Consistency: It's so important to provide consistency with the same familiar set-ups, rewards, and routines. Lastly, always remain calm throughout the process even when through the frustrating accidents. I remember during those first 3 days of training, we scoured everything Google had to offer. We read blogs and parenting websites because we were so desperate to understand whether or not it was working. It felt especially daunting after the nth accident and I just wanted to make sure she was ok -- that we weren't traumatizing her through the potty training process. I so wanted to know what we were doing was right and a part of her growth. My goal in sharing our story is to give hope to others that are desperately seeking tips and advice. My message is that there is hope! Good luck! Hope this helps in some way. It's been nearly a year since lovely beauty arrived and it's been very fulfilling to have a seamless part of our apartment dedicated to my crafts. I'm still organizing the depths of this massive closet and finding new ways to utilize every inch efficiently but I thought I'd share more about what I learned from my process. 1. 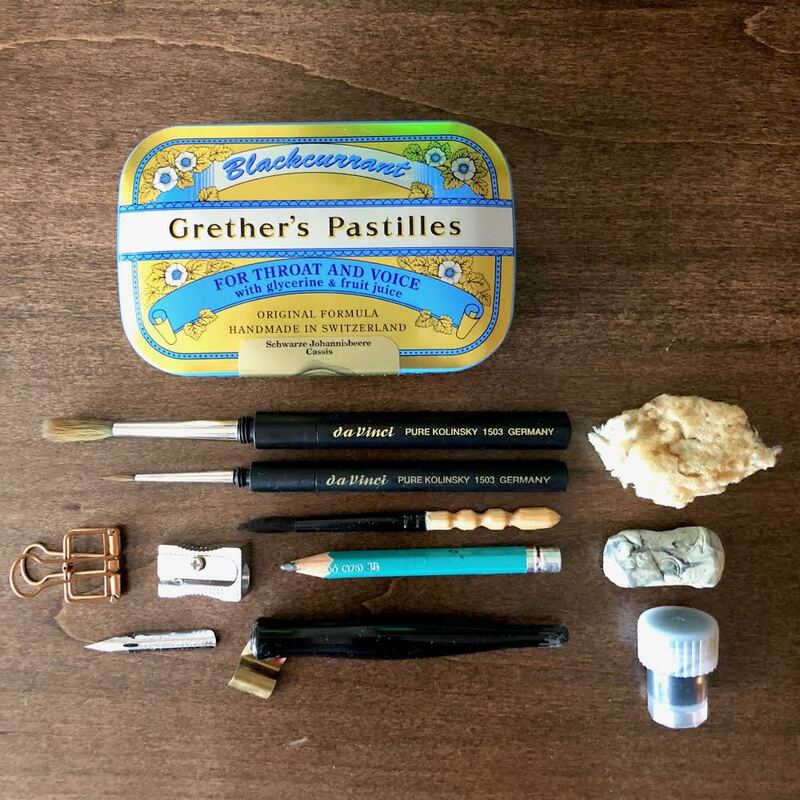 Take stock of tools and supplies. Minimize when and where possible. The same organization rules you've come across in the past for a tidy home are the same ones for your craft closet. If you haven't used the item for over a year, it's time to share it with someone who will make use of it. Or take an adapted KonMari method, and ask yourself, "does the item spark creativity?" Will it be used to create a project in the next few months? If not, again, share it! 2. Organize supplies and tools by frequency of usage. Once I cleared up all of the supplies into just the essentials that sparked creativity, I started organizing by frequency of use and access. Organizing by usage gives essentially forces you to distinguish between storage and everyday supplies. This is an important distinction. Take for example, you have a huge supply of acrylic stamps, but you tend to use just your Project Life stamps on a daily basis while all of your seasonal and holiday stamps are only used once a year. In order for you to create efficiently, you'll want to keep the Project Life stamps in a place that is more accessible than your seasonal and holiday stamps since you won't need those every day. You can probably put your seasonal stamp stash at a higher level towards the back of your closet, so it doesn't get in your way while you're creating. You may be tempted to organize by use or type of craft as that makes more sense for you, but you'll still want some semblance of organization by frequency of use. For example, out of all of my supplies, I use my acrylic stamps and stamping-related tools the most. So that's taken a full two drawers in my closet. I organize by manufacturer but I also have a section of frequently used stamps that I keep in the front of the drawer, so I don't always have to open the drawer all the way to the back. It also makes cleanup easier because I don't have to reach as deep into the drawer to put things away. 3. Measure stash and space. Sketch out a rough drawing with measurements. This is the fun part because you get to bring your visualization to life by putting pencil to paper. But it can also be hard because if you're looking for maximum use of every inch, then you'll also want to be very accurate with your measurements. Start with the sections that are at working surface and eye level. Envision what you need closest to you based on your most frequently used items. Then go up and down. 4. Research custom cabinetry makers. What is the process? Do you render 3-D drawings with clear measurements of each piece of the unit? Can you build the unit flush to the wall including measuring all floor and ceiling moldings? Do you measure the location in person prior to locking down measurements of the custom cabinet(s)? What are the terms of the agreement? How much is the deposit and accepted terms of payment? How many installments and by when? Is balance due upon arrival? How long does it take to make the unit and have it delivered? Does the unit arrive completely installed or will it be built on location? What type of insurance do you have? Do you have references to speak about the custom unit you've built for them? Do you have floor samples of the quality of your work? Do you have floor examples of heavy-duty drawer units and pocket doors (or any other kinds of fabrications you're hoping to have built as part of your unit)? 5. Produce an at-scale drawing, complete with all specifications. Sign off. This was probably one of the most important parts of the process for me and I really appreciated that this was part of the service. The at-scale drawing is an exact blueprint of your unit and you'll want to make sure you account for every detail. Look for where all of the pieces will be connected and where all of the rails and hinges will be placed. Lastly, look at all of the measurements and make sure they meet the specs of your original measurements. This is important for you to review before you sign-off. Then comes the hardest part... the wait. But once it arrives, it's back to happy organizing again! Happy new year! I can't believe it's already 2016. I've certainly slacked off on posting towards the end of last year, with my daughter's birthday planning and the holidays all back-to-back. I've been trying new things with pens and nibs. I've also been working on a few side projects including two names, one for a business identity and another for personal stationery. I discovered that I really enjoy using the Pilot Fountain Pen Custom 742 with the FA nib. There's a nice smooth feel to how it writes on paper and although sometimes, I get the occasional railroading, it generally is a great soft nib fountain pen. To reduce the railroading, I tend to write as I do with a pointed pen, really allowing the ink to touch the paper and letting it be a slow stroke. Skipping between the fountain pen and the pointed pen is a real treat because I've realized just how little I write on a normal basis. After a long week of work, I always feel really rusty picking up the pens. Warming up is incredibly important to get wrists rotating and the fingers used to carrying the curves of the pen since my hands are so used to the shape of the keyboard throughout the week. IAMPETH - A wonderful set of resources around supplies and videos on how to write letter forms. John Neal Booksellers - My favorite go-to for all tools for calligraphy. I was first introduced to their catalog by Hannah Rose Calligraphy. The Goulet Pen Company - When I was researching on the best flex nib fountain pen for my needs, I found the reviews so helpful and learned all about the basics. 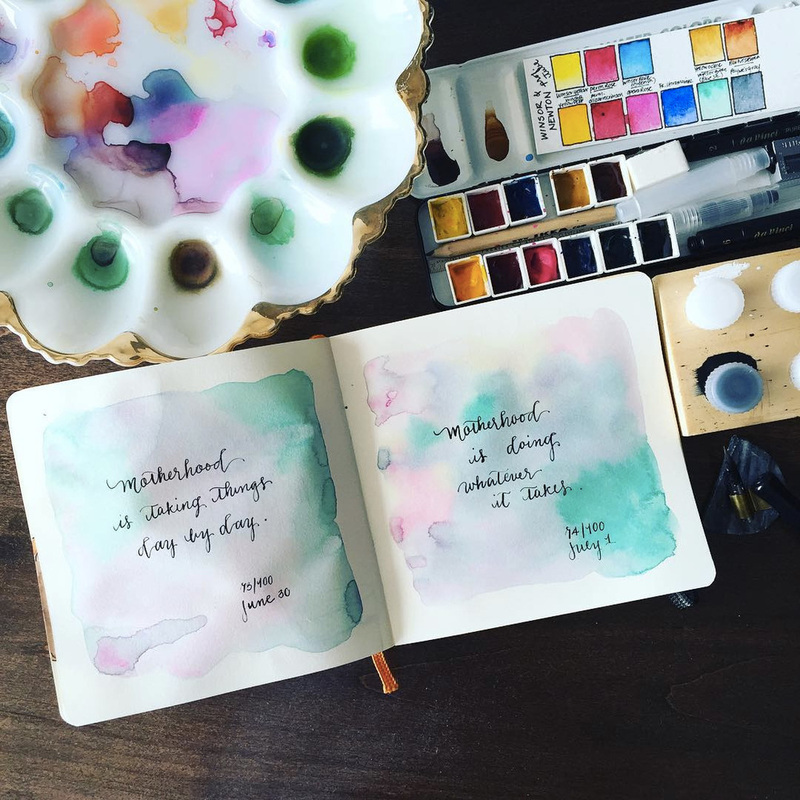 Connie Chen Calligraphy - I first came across Colors of Christ on Instagram and was instantly drawn to her beautiful works of art. She also shares videos of how she produces her work on YouTube and it is mesmerizing! What are some good resources you've come across to learning calligraphy? My daughter loves playing with my jewelry. She's particularly obsessed with my bangles and necklaces which inspired me to make her a necklace. It was fun and she sat on my lap for different parts of the process. The hardest part was asking her to keep her fingers from touching the paint even though it is non-toxic. We got through it and I love how the necklace turned out. My babe is a spunky gal and so I picked punchy colors to go with more wintry colors for our Fall/Winter edition of this necklace. I say edition because I hope we continue to create jewelry together. In due time, I look forward to watching her get her fingers inky as she finds enjoyment in making with me. :) For now, I'll share my process for creating this necklace. 1. Start with bare wooden beads. Use a Dremel to smooth out any scratch bits. 2. Hold beads up with a skewer on a helping hands. Have a tweezer on hand to hold down the bead as you paint. 3. I broke out my Kaisercraft paints from my Kaisercraft Design Team days. After all this time, they're still just right for painting! 4. Patiently wait for beads to thoroughly dry. Add extra coat of paint if necessary. Air dry again and then coat with a thin layer of matte Mod Podge. 5. Once fully dry, string on leather or faux suede cord. Pair the necklace with practically anything! It's beautiful on a blank canvas of a solid white or black shirt, but it also works so well with even busy patterns. It was a hit and she loves it! What are you making?